I stayed at the Hampton Inn in Chesterfield, Michigan on New Yearâs Eve and had a little bit of an unpleasant stay. The guests on our floor were rude and being loud all night â I realized that it was New Years Eve but at 3:30 in the morning, it was time for bed. The hotel staff did nothing to rectify this issue. Finally and more unbelievable to me was the fact that the next day, I found two different credit card charges totaling $50 on my credit card. When I called the hotel, they basically informed me that this was for âincidentalsâ and were rather rude about it and said the charges would drop off in 2 days. When I checked in, the staff told me they needed a credit card for âincidentalsâ and did not inform me that my card would be charged $50. I would assume that meant in case I destroyed something, then I would have been charged. This is something that really should be disclosed at the time you check in and obviously people are going to call about it after the fact. I donât think the staff should be rude either when you do call. Its your or their policy not mine. Needless to say, I got probably 3 hours of sleep because of all the commotion. I was planning a surprise night for my fiance's 24th birthday & i thought the Hampton would be a wonderful spot because it was so beautiful , i was wrong ! Before i booked my room , i asked them directly " do i need a credit card to book a room " they replied " no " so i booked " 1 king suit whirlpool " a week later i get a call from The Hampton Inn saying " you can not book this room because you need a credit card for this type of room " so i had to change my plans because i didnt want to use my fiance card because its a surprise . so i got a " king studio suit "
When i booked in on 12/31/12 , they asked me when i wanted my romance package set up , i said 6:30 because i have dinner plans for 6:00 & i would like it to be there for when my fiance & I come back . when we got back at 8:00 , i had him blind folded to see the surprise , when i got to the room , NOTHING was set up ! it was very upsetting , because i wanted it done for him at 6:30 . i then called down to the front desk & she seemed very ungrateful , " yeah it will be right up " she said to me ! 30 MINUTES later a woman comes to my room and hands me champagne & it was SO WARM when i opened it , i had to put the champagne in EVERY glass i could fine & put it into my mini fridge . Had to wait at least and hour before i could start my night . Then children were running all around the halls screaming which i did no mind because it was only 10:00 , but as the night went on i could not sleep & called down & they said they'd get right on that but did not ! I then rented a movie on the television , & the end got cut off because the fire alarms went off because people were smoking in the hall way on floor 4 ! ( i thought they had secretory for that reason ? ) , so we had to wait outside for about 30 minutes to 1 hour & now my fiance is sick ! Also before i booked the romance package a woman told me included was champagne , chocolates & flowers . i NEVER did receive flowers . Before i checked out there is a plaque saying if im not 100 % satisfied with my stay i dont pay , well i told her and she held out her hand as if to say pay and leave . Every thing that went wrong caused my surprise to my fiance to FAIL & make my night miserable & everything went wrong on the Hampton Inn's part . 6 ) when i checked out they did not care about my satisfaction , they wanted my money and wanted us gone. I paid a total of : 220.33$ & i do have my receipt & i do want my money back because it said on the plaque on the door , " if your not 100% satisfied you dont pay " well i was not & when i was there they did not follow that rule & did not care . I would not come back again , & i do NOT recommend ANYONE to go . I work for FEMA and when I checked in to Hampton Inn 10-20-11 located Hershey, PA. I gave the desk clerk a tax exempt form for the state of Pennsylvania, The next morning when I checked out I notce that the taxes had not been removed from my check out receipt. I asked the desk clerk, could she look for the form that were submitted for tax exemption, which she did, but stated that she could not remove the tax, because her Manager was not there. She than made a call to her manager; and were told that she could only remove the County room tax but not the state tax. I informed the clerk that I need 0 balance with the correct pricing on the receipt, which she said that she could not provide.The clerk wanted me to leave with a inconplete receipt and stated that her manager would e mail me if correction needed to be made. I finally decided that i would pay for the taxes and went to turn my key in. That manager just walked in and did give me my 0 balance. This was very stressful in a stressful situation because no one was availble that was knowlegable of dealing with matters like this. I have always enjoyed staying at Hampton Inn, but this is far the worse encounter that I have experience at any Hotel. I by mistake booked a advance reservation online. The day before we were traveling I realized after a call to the hotel I had made the reservation on the wrong date. Don't know how this happened but it did. The hotel had a room on the night we needed it but would not let me change the reservation to that date. I have talked to numerous people and it is the same run around, they frankly could care less about my problem, offer no solution, no help and I am out of $108.00 that I did not have to lose. I have never been treated so badly by any company, the unconcern is unbelievable. I will never ever stay at a Hampton Inn and will advise anyone I can to never stay with this chain of hotels. They don't care about their customers! I made an advanced reservation at Hampton Inn. On the day of arrival a snow storm had closed the major interstate highway (I-80) forcing me to cancel my reservation. I asked for a refund and was told "no refunds". I tried to explain that due to conditions beyond my control (snow storm), I had to cancel my reservation and requested a refund. The "advanced reservation" department was extremely rude, unhelpful and could care less about my situation. I asked if the $158 dollars could be used towards a future reservation at Hampton Inn. I was told "no, that's not possible". I am out $158 dollars. I will never stay at Hampton Inn. I am going to recommend that that no one from my place of employment (1,500 employees) ever stay at Hampton Inn as well. I stayed at the Alexandria VA Hampton Inn (1616 King St) from 3/27/13 to 3/30/13. Upon checking in a person who appeared to be homeless was sleeping in the lobby. Each morning people came off the street, put breakfast items in their pockets and left. One morning I went into the unlocked lobby restroom and a man was in there washing. Another time a barefooted man came in to raid the breakfast bar. When I complained to the desk clerk she wouldn't do anything about these people and seemed not to be concerned. At $250 per night I expect more security and don't want non guests hanging around the breakfast bar and lobby. I have never experienced this in over 40 years of staying in hotels. We checked into the Hampton inn in Newberry, SC. We were so disappointed! First no MSNBC on the tv. Then we could not access the Internet on our own iPad or the hotels computer. That happens sometimes we were told. Going into the bathroom we noticed mold around the bathtub and the last straw was when my husband killed a big roach in the bathroom ! The desk clerk made no apologies and we left! We have always been happy with Hampton Inn and look for them as we travel. We were very unhappy with this one and will look elsewhere in the future. Checked in and out within hours due to bedbugs in room. I was told by the clerk that there were no other rooms available so if I choose not to stay they couldn't help me. I was truly out done, who wants to choose to stay in a room with bedbugs. It was explained to me that i would not be charged money woukd gi back on my card in about five days. i stated i understand what you are saying but coukd you pkease give me something in writing staring i wont be charged. she said she couldnt provide me we such. i told her tgat im traveling from out of town and do t want ti fet hone and never see my money and have no proof but a picture of the bugs. Another toung lady started her shift and helped with tge matter...but still didt want to document no charge. i had to literally act loke a fool and threaten to knock on every doir and inform tgem of bedbugs in the facility. Then she made the notation, after to long if going backwards and forward. So, being without hotel money to stay anywhere else if i wanted to...i had to travel back home to baltimore from nc. I was out raged. I was told the manager couldn't be reached over tge weekend. Not only do I want my money back, but want a complimentary stay at a location where I feel comfortable. We were extremely disappointed with our stay at the Hampton Inn at Tarpons Inn, Florida. We had to ask to change our first room because of the smell of cigarette smoke in the room. The staff was very accommodating and changed our room. We were not happy with our second room because it was 1) dirty; 2) wall paper was peeling off the wall; 3) coffee machine dirty; 4) upholstery on the chair was stained and dirty; 5) mold on the ice machine; 6) broken tile; 7) no hot water at lavatory sink; 8) disable bar was broken; and 9) bad lighting in bathroom. I took pictures evidencing the aforementioned conditions. I am a Hilton Honors Award member and never stayed at a Hampton Inn where I encountered these conditions. Please do not hesitate to contact me. I made a previous complaint, had no idea it would be posted actually thought it was going to the complaint department. Also, thought I deleted it due to numerous typos. But, the fact still remains that it was the worst experience ever. I made reservation to stay at the hampton Inn in Manhattan, kansas two weeks ago for my businees trip for the federal government. Upon arriving to my businees that I was investigating I found a Marriot right across the street from the company. Having to work their two days and long hours I went to the Marriot and asked them of room availability, and they had one available. I asked the clerk to give me the phone njumber of the Hampton Inn in Manhattan, Kansas so I could try to cancel. I received the phone number from the clerk and called the HJampton Inn in Manhattan. I was advised by the desk clerk that the hotel was not sold out and that I would be charged since I did not give a 24 hour notification. The clerk also told me to call back because if the hampton could sell my ropom I would not be charged. JUpon completing my appointment for the day I returned to the Marriot and inquired again about a room for the evening . The clerk (a new person) said one was available, and I again asked for the Hampton Inn's phone number in Manhattan, Kansas. the clerk from the Marriot gave me a phone number and I called waht I thought was the hampton Inn in Manhattan, kansas. a clerk answered the phone and I advised her that I had made reservations and wanted to cancel if my room could be sold. The clerk stated that she could not find my name in the log book, and she further stated that because she couldn't find my name that the reservation must have been cancelled. So at that time I accepted a room at the Marriot Hotel. After dinner that evening I called agaion to the Hampton Inn and found out that my reservations had not been cancelled and that the clerk at the Marriot had given me the wrong number, and that the number she gave me was for the local Hamption in Junction City, Kansas. the clerk that told me my reservations were cancelled was Ashley. Now I am stuck with two hotel bills for the same nite, and it looks like I tried to commit fraud to the federal government, as my government credit card shows two hotel bills for the same nite. I asked the manager for the Hampton Inn in Manhattan that since I was being charged could I stay at the hotel. After traveling over 7 hours with three small children on our first vacation in 10 years, (the best I could manage was 2 days off) we arrived at the Hampton Inn in Arcata CA with which we had made reservations 4 months ahead of time, only to be told that our room had been given away 45 minutes prior because there was something wrong with the card number in their file. They called our home, obviously to no answer due to fact that it was 400 miles away and we were driving. By now I have a wife and three kids crying in the car with nowhere to go and the only thing offered is the number to some no name roach motel. The only reason we were going to stay there was because they have been decent in the past. It is a full hour away from anything we had planned on doing on our short visit. They haven't offered to do anything to make it right. The 10 year old looking desk jockey had the power and authority to ruin our weekend but none whatsoever when it came to saving it. I'll definitely not use a Hampton owned business again if this is their policy towards customers and families. We are an honor member and we have stayed at several of your other chains of hotels including the Hampton Inn. Are experience has always been pleasant and rooms in the past have always been neat and clean. In our most recent stay at the Camarillo, California Hampton Inn our visit was not pleasurable. The Hotel is under construction the whole first floor was stripped of all furniture and construction workers were in most of the rooms hanging wall paper. This is the way we had to enter the building to get to our room on the 3rd floor. The hotel is in dire need of a renovation and should not be open to the public during the renovation. The comforter in the room looked like it had been washed repeatly and the was extremely lumpy the bed was hard and uncomfortable. Had we known the condition of this hotel we would havc selected another hotel in the area but we have always had such a nice experience in the past. 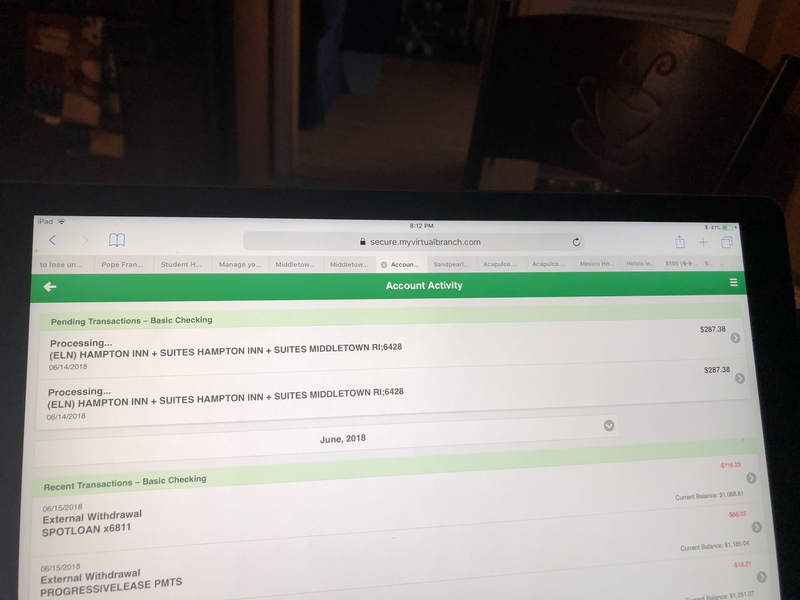 The cost of the room was $143.60 plus another $25.00 our confirmation number is 85089388 we would really appreciate being reimbursed for the the expenses incurred. When I checked in on the 23 of jan. the lady at the front desk was very nice. When I got to the room on the 5 th floor thought that was nice. In the room there was no safe. I have iPad cash other valuables I wanted To put in the safe while at the mecum action.the wi fi only works in half of the room not at the desk. First night was fine but second day when back to the room from dinner the key did not work. Went down and The girl ran it through the machine and I went back up. Still not working. Noticed the phone by the elevator So tried to call down to the front desk but no answer so back down again. Girl said I will call matinance I went Back up but no one. Getting frustrated so called again and this time she answered and said the same thing. He will be up. Finally he got the door opened. We booked 2 rooms for arrival 02/28/13-departing 03/02/13, one for my wife and I another a friend (who paid for there 1 room ) while were to pay for the other (1) room. when we received our cred card statement we found that we were charged for 2 extra days that we were not there for, to the amount of 268.94. We have left a number of messages to a Kimberly Newsome who we were told by calling the number 912-721-3700 that she was part of the H.R. and accounting department. The phone number that we were given is 912-721-51711, our calls were NEVER returned, and requesting to talk with the hotel manager it seems they were always in a meeting and also to busy to return our calls. We find this type of service to paying customers very unsatisfactory, discourteous , and unprofessional and will never recommend or use Hampton Inn and Suites again. The Inn that we used is, Hampton Inn and Suites 20 Johnston St. Savanna Ga. 31405. I had trouble with internet and your workers made me feel I was putting them out by asking for assistance. I ended up using my phone hot spot to transfer info to my main office. Then I noticed these employees used all the disability parking spaces for their personal veichles. My stay was last tu through fri at Pueblo, Colorado North Hampton Inn. My comments is not intended to receive anything from the Inn. dMy intent is to make a better stay for others. I made an online reservation at the Beaufort, SC Hampton Inn for September 26th which was not honored upon my arrival. This reservation was one of twenty online reservations I made for a bicycle trip I did with a friend which took us from NJ to Florida. Along the way, where it was possible I stayed at Hampton Inns (totalling seven). I mention this for two reasons...first, to make it known that Hampton Inns are my hotel of choice and second, to make it known that I know exactly how to make a reservation. It should be noted at this time that I had special circumstances which caused me to not only use the online tools but also caused me to contact the hotel's desk at the same time I made the reservation. The reason for this occurred because of the bicycle trip. My friend and I did this trip largely unsupported but there was a time frame between 9/21 and 9/28 where we were accompanied by a third person. The very first reservation I made went like this...I found a suitable hotel in route. Before completing the process online I contacted the hotel's desk and asked the following questions. I asked if it was possible to put a rollaway bed in the room and what the cost would be? When I was satisfied with the answer I asked the desk person how do I make this special request online? She said you can't, but go ahead and complete the process and then call me back with your confirmation number. It was a simple and practical approach to ensure that both the hotel and myself were on the same page. Therefore, I used the same process for the entire duration that a third person was in play. I also put the request in the comment section as an added reminder. Each desk person told me they would make the entry in their comment file as well and added that the rollaway bed would placed in the room prior to our arrival. That is exactly what occurred in each instance until we arrived at the Beaufort, SC Hampton Inn. After pedaling from Charleston, SC we arrived and were told they could not accomodate this request. I said, "how can you not accomodate us when it was agreed upon weeks earlier"? A Ms. Brittingham informed me that it was impossible that any such agreement could have been made as no one there would have allowed that arrangement to be made. She added that Fire codes do not permit a rollaway bed to be placed in their rooms. I asked why I would be told to go ahead and make the resevation and why would they make the notes in their system and tell me that it was something they could accomodate? Her response was that I never made any such phone call stopping just short of telling me I was lying. When I pushed the issue about making contact with the desk she then informed me that her records indicated no call was ever received from my telephone number and that I must be mistaken.Ironically enough I have an email confirmation from them acknowledging the request was made clearly evidencing they documented receiving it. I think it is Ms. Brittingham, nasty attitude and all that is mistaken. What she didn't know is that I am a Comcast Triple Play subscriber. Among the services they provide is telephone. The really great and unique thing about their phone service is their online record keeping regarding the phone calls I make and receive. It's funny that Ms. Brittingham emphatically denies that I ever made the call in question and that her records belie my assertions that I did when I have phone records proving that I did. I would be very happy to provide this documentation along with the email from them acknowledging receipt of my request. At any rate, as this conversation was taking place it apparenlty was at the end of Ms. Brittingham's shift and she departed leaving me and my group and the young lady at the desk in an unresolved situation. I then pressed the new desk person for answers and help. I informed her that only a couple days earlier we had the very same resevation at the Myrtle Beach Hampton Inn and the said nothing about Fire Codes. She said look I cannot do it Ms. Brittingham told me very clearly that I was not permitted to help you. Now this left us and the this young lady in a very vulnerable position. I believe she wanted to help us but her job would be in jeopardy if she did. We, on the other hand were told we had no room after pedaling more than 70 miles from Charleston. Fortunately, although this young lady was not permitted to help us at the Hampton Inn she nevertheless went above and beyond by calling around to the Fairfield Inn and eventually got us a room at the Holiday Inn. I was very upset to say the least and until I calmed down I have to tell you it brought into question any future loyalty I may show toward Hampton Inn. I just couldn't believe I could have a confirmation number and documentation supporting my assertions that I agreed upon accomodations and yet an employee could disregard all that and essentially call me a liar. Furthermore,I just couldn't believe the Corporation offers no avenue for recourse. It was like sorry buddy it's your problem not ours. If that is your policy please let me know, but if it's not I would like to know how you can fix this. The gentlemen who was working the front desk, David, was the most unfriendly worker I have ever met at a Hampton Inn. He did not seem to be very good at his costumer service, and seemed to 'huff and puff' at any question I had for him. I felt like I was putting him out just with simple questions. It looked as though he was making 'key cards' when we arrived, and he didn't acknowledge us for a few moments, and when we did it seemed like we were a bother. Then later I asked if we could get a childs crib/playpen brought to our room, and he just said very abruptly, "well I'll have to go see if we have one available" and just walked away, then a minute later he came back through the lobby, and I asked if I should wait, or go to the room, to which he said, 'no just go back to your room, if I find one, I'll bring it" again very abruptly..., it just didn't seem appropriate. Then the last thing was in the evening I brought my son downstairs to get a little cup of hot chocolate before bed, and as I was looking to see if they had hot water I only saw coffee, so I turned around and asked David if there was any hot water. He did not even look up at me.., a few seconds went past and then he just walked away..., this was bothersome to me, and I thought maybe for a minute that he possibly didn't hear me, but then he re-appeared with a container of hot water, walked up by us and set it down next to the coffee rather abruptly, again without saying anything, then went back to his desk. I don't feel like I was being overly needy, and I don't feel like the things I was asking him should have bothered him that much. I stay at Hampton Inn's almost anytime I travel and I must say that I love all of my experiences, but this one really set me back. Not to mention that it was on Valentines Day, and I was hoping to have a romantic evening with my wife, and then to be met with this gentleman and his attitude kind of ruined the night. We used our Hilton Honors points to set up this free stay, but I must say that everything was pretty well ruined by this experience, and I would like to have some free vouchers or something to stay another night at another Hampton Inn. I know Hampton Inn has their 100% Guarentee, and I would normally never ask for this (and I never have had to ask for this,) but I feel like this time warrents asking for some type of refund. And I think someone should definitely talk with David at the Richmond Southwest Virginia Hull Street Hampton Inn about his Customer Service Skills. I recently stayed at the Hampton Inn buckhead in Atlanta GA. I have never had any issues with any Hampton Inn in the past. I was there training for a new job. The first room I had the bed was horrible and was lumpy and just unfit to sleep on. After I had been in that room for several days I noticed there was black mold coming through the Sheetrock in the bathroom ceiling. This explains why when I walked into the room I immediately started sneezing since I am allergic. On the Friday I was there the fire alarms went off every 5 - 10 minutes for over 2 hours. Another person attending the training found a roach in her bed. When they moved me to a new room the toilet was so close to the wall you could not flush the toilet. I had to take one finger go underneath the handle and flip it up to flush. Originally sent my complaint letter on paper, to this address. I have not received any form of reply. Hampton Inn Corporate Office Headquarters, Hilton Worldwide, Inc. 7930 Jones Branch Drive, McLean, Virginia 22102 USA March 13, 2014. Dear Customer Support & Public Relations, I am bringing to your attention a situation that happened to me when I was a recent guest at the Hampton Inn Hotel in Carson City Nevada. My wife and I had just checked out, beginning our day, as we were leaving the parking area we noticed an item in a large mud puddle that appeared to be a flag of some kind, red, white, and blue. We stopped, went to retrieve it, it was a United States flag, we were thinking it was the flag that Hampton Inn displays in front of their entrance way. It had been quite windy, stormy, and rainy the night of March 5-6, 2014 it was still attached to a pole of some kind, not from the front of your hotel. Without any other options, having no idea of who actually owned the flag, we returned to the front of the hotel. I carried it in, in hopes that the desk clerk would be able to care for it. (There were two people behind the desk) The young lady clerk took it from my hand. I cannot remember what she said; it is what she did that really raised my ire. All be it the flag was dripping wet and dirty, she took it back outside and dropped it on the ground and said she would get their maintenance person to care for it. At the risk of using words that should not be used near a US flag or a lady, I asked that she at least lean it against the building, off the sidewalk. She said she would get the maintenance man. I hope he took better care of it than she did. Being close to tears and very mad, my wife and I then drove away. It has taken several days for me to calm down enough to write this letter. Hopefully I will receive some correspondence from you in the near future, acknowledging this. My wife and I visit Carson City fairly often; we have found this Inn to serve our needs very well. However: it will be some time before we return. Sept 1, 2013, I moved to WA to provide in home care for my father, and my mother, who is in a nursing home with Alzheimer’s. March 16, I flew my husband & 2 boys from KS to visit (after not seeing them for 7 months). I chose HI because I’ve always been impressed with my stay, & wanted my family to have a clean, comfortable room for a 5 night stay. The 1st morning, 3-17, our room was not cleaned. I notified Jordan at desk, who took notes on my complaint and said he would tell maids. Maids 1st insisted there was a DND sign in lock. sign was under vanity by ice box (after looking 20 min on Tuesday). Then, maid changed story that my husband said we didn’t need service (no towels, garbages full, he would never say that). He actually told her to come at 11:00. Again she stated a DND sign in door. We dumped garbage and got towels ourselves. Tuesday, room was cleaned, but not well (dirty tissues under vanity, hair on toilet & floor). Mgnt was told. Wednesday, son had a bloody nose on bed, desk told, room was somewhat cleaned. Thursday, room again was not well cleaned, (bath), bloody tissues under vanity. In looking for remote, I found a tampon (in wrapper) between bed and wall. Mgnt told again. Also that Thursday, breakfast staff told me I wasn’t allowed to eat because I was not a guest (I paid for room, under my name), I was having coffee with husband. This I didn’t mention to desk. GM Mindy Delozier & I talked on phone for 30 minutes. 1st, she offered guarantee of not paying for one night. Later in talk, it was implied by her that since the entire stay had problems, she would stand by her guarantee of not paying for stay. After being charged full amount minus 1 day, she insisted she didn’t offer the guarantee. I told her I was NOT satisfied with only 1 night, and reminded her of guarantee and my disgust with room, especially seeing the tampon. I strongly believe HI should stand by it’s guarantee and refund the full amount of my stay. I am NOT satisfied at all. Due to a death in the family, and Memorial Service was Friday 4/5, using our Hilton Honors, we booked a one night stay at the Hampton Inn & Suites Atlanta/Duluth/Gwinnett County. We checked out on Saturday morning 4/6 and returned to Apex, North Carolina. Upon arrival at home I noticed we had left our bathroom bag hanging on the back of the door in the bathroom of Room 707. I immediately called the hotel which was roughly 7:15 PM. The clerk at the desk stated he could not help me with that as he knew nothing of lost and found and I could talk with the Director as her door was locked and she wasn’t in at that time. I called back later asking if anyone there could find out if the bag had been tuirned in as I could have a family member come by and pick it up, but didn’t want them to drive there if the bag was not there. The clerk was courteous enough to call me back and let me know he had tried to reach the Director and called her Barbara, but she did not pick up so he left a message. I have as of yet to hear from Barbara. I called back the next morning and tried to talk with Barbara, but could only leave a voice message. I tried again today to talk with Barbara but had to leave a voice message. I advised Barbara on two of my messages that upon leaving, the cleaning lady was in the hall with her cart at our door and was either getting ready to clean our room or the room next door. I spoke to her and proceeded on my way to the elevator so she had to have gotten the bag. There is a possibility the bag is still on the cart and had not turned it in yet. My issue is due to the fact the bag is a matching part of our luggage and would like to get it back because of that. Also, the contents were make up, soap, shampoo, razor, shaving cream, etc. and will take a lot to replace. We have planned vacation for next week and the longer it goes, the less likely we will get the bag for this trip. Hopefully someone will be able to help us. For 3 years we have been coming to the Hampton Inn Gloucester for my granchildrens b’day. This year I did things different and made my reservations on the computer. I googled Hampton Inn hit on the site to make reservations for 2 adults/3 children. The next day I get the confirmation and the it’s thru hotel reservations. We get to the hotel after driving 5 1/2 hours. The kids go change into their swim suits,we go down to the pool and i’s green and nasty. Saturday we have the kids b’day then go back to the hotel so they can swim. They go change and go to the pool only to find out it’s closed. Don’t they have people that check these pools thru out the day? My husband went to ask about the pool,and if we could get a refund so we could leave,there’s nothing to do at the hotel,we go there so the kids can swim. But because I did my reservations on the computer not knowing they make it look like your going thru the Hampton Inn we couldn’t get a refund. I would like this resolved,either my money back for Saturday night,or a free night. We feel like the Hampton or the hotel reservations owe us! We had 4 very unhappy campers ages 4-7. This is my 3 attempt to get this resolved,I called a number for complaints,it was foriegn people they say they can’t hear you and hang up..this is poor customer service.Hampton Inn Gloucester sent me a survey to do but haven’t heard aanything. I really wish I could get this resolved! I have made a reservation for Hampton Inn, Atlanta Airport, on Bobby Brown Parkway, confirmation #88017478. The reservation is for two rooms. The confirmation I receive is for 1 room. I have called four times and the clerks tell me the computer shows two rooms so I shouldn’t worry about it. I tried to call the manager, left a message, but no response. One clerk said she would fax me a confirmation and I got two sheets of paper, exactly the same, with the same confirmation number on both, saying this will be sufficient at check-in because I have two pieces of paper for each room. All I want is written confirmation for two rooms like I have gotten with every other Hampton Inn I have made reservations with. My friend had bookd a 2 night stay at the Hampton Inn in Ormand Beach, FL. As soon as I got the number I called it because I had a few things in mind, without knowing I was speaking to the “Manager” itself, I asked about the ammenities of the room, she state”d, “this is not a Suites hotel” all because I asked if there was a mini refrigirator in the room. Then asked if there was anything else in the room besides the two beds she stated “just the handicapped bathroom and the two beds” by the way, I didn’t ask for a handicapped room. I asked, is there any chairs or sofa’s she stated no. Based on that infomation, I asked how soon can I cancel she said 6pm. I stated to please cancel one of the two nights instead she proceeded on stating “why don’t you just cancel the whole reservation, and you are getting a privilidge rate.” I was very upset by her comment, I asked her that she did tell me cancellation time however never stating for what day if day before or same day she said “what do I think”. The discount she was talking about it was a $5.00 different from the advertised rate, is not like she was giving a free room a 50% discount on it. Not only that, when I cancelled the one night, she up the rate on the one night because I was getting a better deal with two nights. Was forced out of my house due to plumbing issues and stayed at the Hampton Inn in Hanover, Pa with my wife and 2 children. Apparently they dont care about thier guests in the least. We had roof construction directly over our bed at 8am everymorning for 2 weeks. When I complained at the front desk the lady offered me a bowl of earplugs. Absolutly ridiculoous to even make money off a room where people can’t sleep. I’d estimate the noise was around 95db. Hampton Inn, Bethlehem PA. We book three rooms for the night of my nephews wedding. We were promised that we could also have a rollaway bed at an extra fee which I agreed to. When we got to the hotel the room with double beds were not much bigger than single beds and they had no roll away beds. Also other people booked rooms and when they got there they were told that the hotel was overbooked and they had no rooms. I was always under the impression that when a bride and groom reserve a block of rooms for their guests that they would be together. Well we were all over the hotel and it made it impossible to meet up with anyone afterwards. This is the last time I will stay at a Hampton Inn. Don’t be fooled when the Hampton Inn advertises something like “We welcome wedding parties” or something similar. I booked my brother’s wedding guests at the Hampton Inn, Islandia, NY, Long Island. Our guests took up most of the 3rd floor. Coming back from a wedding, you can expect people to be noisy – and we totally were. They told us to stay in our rooms. Then they told us we were too loud and we had to move to the lobby. Then they told us we had to go outside in the parking lot because we were still too loud. Finally, they called the police. The police told the Hampton Inn management that they were basically idiots and to stop wasting the police force’s time. In my opinion, don’t “welcome” 50+ wedding guests to your hotel if you’re a hotel that has a “no party policy”. The management single-handedly ruined my brother’s after party. The assistant manager that was working that night seemed to just be a cruel woman who hates her own life. We didn’t break anything, ruin any property or be disrespectful towards other guests or employees. We were just 50 people enjoying ourselves after a wedding at the Hampton Inn.